In case you missed it, the Republic of Singapore Air Force (RSAF) Facebook page has kindly compiled an album 35 images from this August's Exercise Red Flag - Nellis 17-4. It was uploaded yesterday (28 August'17). 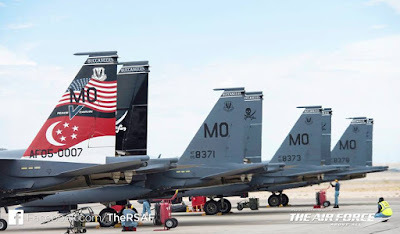 Among the images is one the RSAF FB previously posted on 26 August of F-15SG Strike Eagle tail fins. It's unremarkable as a picture, apart from the special fin flash with the flags of the United States and Singapore that add a dash of colour to an otherwise grey warpaint. The earlier post hardly generated any excitement among RSAF watchers, who regularly conduct bird population census. So the Red Flag album provided another chance to present the image to netizens. It's the numbers that matter: The image is believed to be the first officially released by the RSAF with tail numbers that suggest an upsized F-15SG fighter force. These are numbers 05-8371, 05-8373 and 05-8378, with the Mike Oscar code assigned for birds that roost at the United States Air Force Mountain Home Air Force Base in Idaho. The base is home to the RSAF's Peace Carvin V detachment, which flies F-15SGs under the banner of the 428th Fighter Squadron "Buccaneers". Long story short: Singapore started off buying 12 F-15SG in September 2005 to "replace" ageing A-4 Super Skyhawks, which interestingly enough had already been retired from frontline service on 1 April 2005. This was followed by a second batch of 12 F-15SGs in 2007, bringing the official tally to 24 birds. In yet another example of defence creep, two batches of eight F-15SGs further enlarged the fleet to 40 F-15SG tail numbers that have been tagged by defence watchers. Some speculation abounds on whether this fleet will grow again, as the much-anticipated order for the F-35B Joint Strike Fighter has yet to be inked. In the meantime, it may be worth your while reading up about swarm UAVs UCAVs. #justsaying. Plot twist they released those serial no.s because they ordered more lol. One notes that F-15SGs have been spotted flying&parading without CFTs recently! As the region going to be infested by Flankers, it is wise that RSAF expand its fighter fleet. Likely more advanced / stealth version of F-15SG, another 20-40 more as F-35B delayed.One of the F-15SG is reported to be an experimental aircraft as details on this aircraft is unknown. Unknown sys are installed and tested in that one-and-only ac. And @ Ben, maybe you should just be a "ninja" in that ID forum. Let all those ID, MY and others from other part of asia arrogant haters do the talk. For you just stay away from commenting. All along they hated Singaporeans no way you can reason with them in any meaningful way. Let them be, just stay out. Beside, keeping silent by not saying a words of any of the defence military stuffs is good to a nation like Singapore. You are so right. Time to go ninja. I disagree. Deterrence works by squashing fake news or fake bravado. The other neighbours can say what they want. End of the day they almost likely will twist facts and accuse SG here and there. By not putting them in their place we are sowing the seeds of fake bravado in them. That will reduce our deterrence. When they are forced to admit they are faking news they will be afraid to keep on doing it.